Inductees: Hank Aaron, Happy Chandler, Travis Jackson, Frank Robinson. This pin is rare. 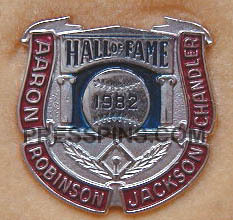 Only 600 Hall of Fame pins were issued in 1982. The pins were manufactured by L.G. Balfour.